I didn't set out to make a mini-wardrobe in 8 days, but I did. I started a week and a half ago on Wednesday with the black and off-white t-shirt which I shared with you in my last post. Then the next day on Thursday, I made the black capris. Great, now I had one complete new outfit. Then Friday I made the black and red t-shirt. Wow, another completely new outfit with the black capris. Then I started to plan. Next, Saturday I made the black eyelet shirt. Then on Sunday I started the red collared shirt, which took two days. Then I took a day off to go to the movies and lunch with my sister. Then Wednesday, the 8th day, I made the red jeans. On Thursday, I rested and my friend, Stephanie came over and she sewed. Today I got Son to take pictures and put together my collage. The garments are probably way too little on blogger to see much, so please click to enlarge. I thought I would only get 12 different combinations, but turns out I got 16. Make sure you click on the photo to see them all. The trick to sewing a mini-wardrobe in 8 days is tried-and-true (TNT) patterns. You probably didn't recognize it, but both the red shirt and the black eyelet top are both the same pattern as my whimsy shirt I made a couple of weeks ago. I drafted a facing for one and a collar and button band for the other. They both have the same sleeve, I just removed the puff and lengthened the pattern for the red shirt. I'm so upset about the black eyelet shirt. I'm sure the fabric had been pre-washed, but I washed it after sewing and it shrank. It's a lot shorter and tighter than when I sewed it up. The pattern started out as a Burda Plus WOF half sized pattern, but I've redrafted it so much that it hardly resembles the original. The red shirt gave me fits. First, I made the most beautiful collar that rolled over so nicely, then proceeded to sew it on backwards. Of course, I didn't notice that I did until I had clipped all the corners, really close. Luckily, it's not very noticeable. Both t-shirts are from the same pattern too. On the red and black one I made an inverted box pleat at center front and on the black and off-white one I used gathers and a contrasting yoke. Both sleeves are the same. The basic pattern is KS 2900. Both pants are well loved and often used patterns. The capris are S5013, which is now OOP and the jeans are a Burda Plus WOF capris pattern that I've tweeked and made full length. I've since reshaped the pockets as well. It hardly resembles the original pattern. So there you have it. My secret to a mini-wardrobe in 8 days. Did you notice my new hairstyle? I just had it cut and styled. We'll see how it looks when I have to style it on my own. 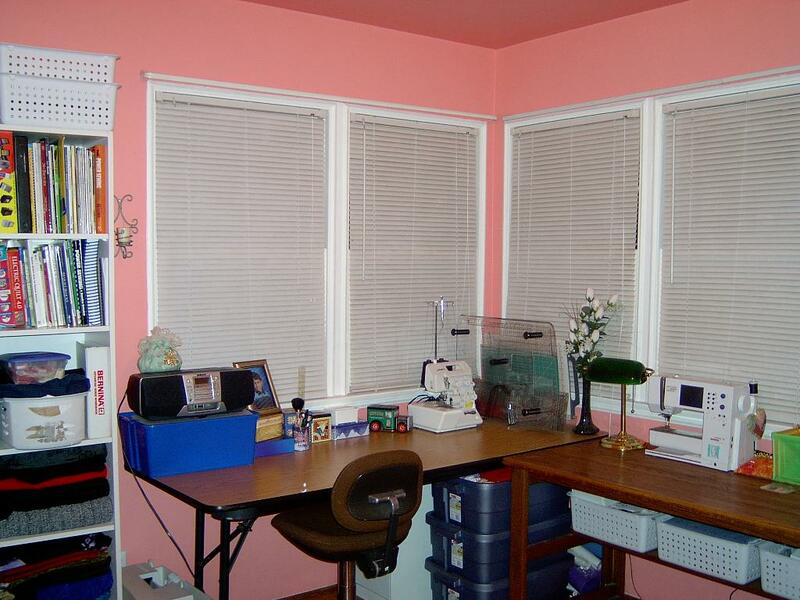 It is so much easier to sew when my sewing room is clean. I wish I could be disciplined enough to clean up after every project because sometimes it get so messy in here I can't do anything. The room has just recovered from one of those paralyzing states. You'll need to click on each photo since part of them are being cut off by blogger. 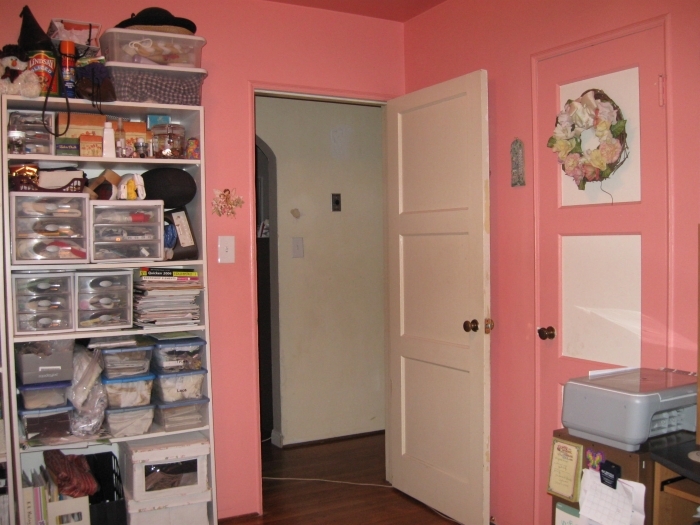 This is the southwest corner of my sewing room. The windows gives off a lot of natural lighting and the west windows (on the right) give off a lot of heat. The new air conditioner is in the south window now. On the table is a Bernina 170, a Juki MO-654DE and a Babylock Coverstitch machine. When I sew I like my sewing machine on the left and the serger and/or coverstitch machine on the right. Then I can swivel back and forth between machines. You can see two laundry baskets full of stash overflow. 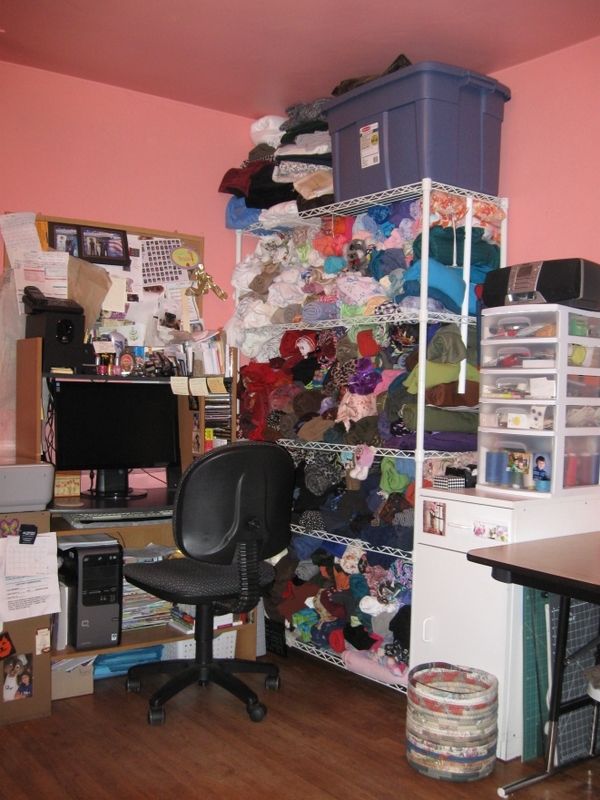 This is the southeast corner of my sewing room. You can see the lion's share of my stash. I have over 350 pieces of fabric on the rack anywhere from 1 - 5 yards each. It probably averages 2.5 yards each. I keep thread in the cabinet drawer and in the cupboard along with my embroidery module. Buttons and office supplies are in the clear drawers. You can see beside the cabinet is my smaller cutting mats and square-up rulers along with my large clear table extension for the sewing machine which I only use for quilting. Under the computer table is a large stack of Burda WOFs. Notice the wastebasket. It's made of fabric too! Here's my closet door and the door to the hallway. On the shelf are drawers for most of my sewing notions and supplies like lace, elastic, and zippers. My ironing supplies like the hams and clappers are also on the shelf. Here's the shelf with my sewing books and Sew News and Threads magazines. The bottom shelf is mostly quilting books. The cabinet has my patterns, UFO projects, and supplies like interfacing and shoulder pads. I also keep Judy here. I wish I had a real place to keep the dress form. 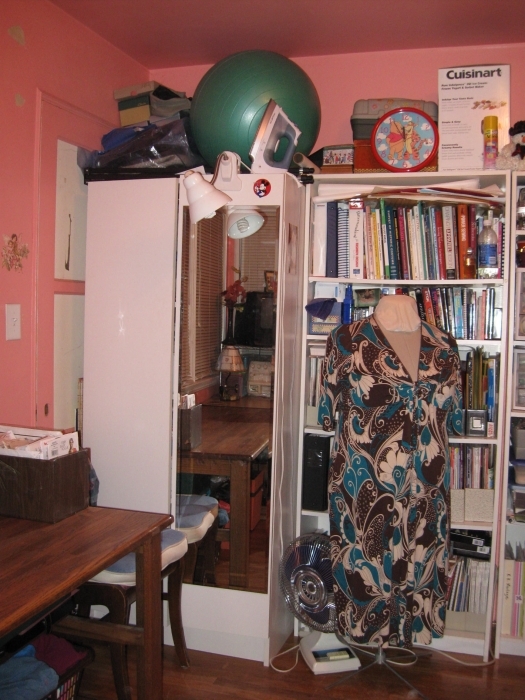 When I'm sewing, I put it in the closet and put my ironing board in front of the bookshelves. Sometimes I put a small folding table next to the bookcase by the door and trace patterns or do some pattern drafting. That way I can also watch movies on my computer. My TV in here isn't any good except for VHS. I can also play DVDs with the portable DVD player on it, but it's easier to just pop them into the computer. Besides, the monitor screen is larger than the TV and it's a widescreen. With my room looking so good, I'm sewing again. I'm dragging my feet on making the alterations for the wrap dress. I don't know why. Maybe today I'll get it done after I make the capris to go with this new top. I just crawled out of bed so forgive the bed head and no make-up. Son got a bit cheeky too while taking pictures. His school bus came before he could get a proper one. This is my TNT t-shirt pattern with a yoke cut into it and center front gathers added. The fabric is a 1 yard piece of poly/lycra jersey I got from FIDM (Fashion Institute for Design and Merchandising in Los Angeles) at their scholarship store. Everything there is $1 yard and sometimes they get some really expensive designer left-overs there too. The yoke was cut with some leftover jersey I already had from another project. So essentially, this new top cost $1. Coldwater Creek would have charged around $50 for it and it certainly wouldn't have come in my size. Thank you so much for the nice comments on my whimsy shirt. I love it and plan to sew it again. Maybe not with the contrasting fabrics, however, it would be too distinct and then people would know that I sew the same patterns over and over again. It's been about 99 degrees outside and 90 inside my house for the last couple of weeks and I haven't felt like sewing. However, I didn't have much time to sew until now. So I went out and bought myself this tiny little air conditioner for my sewing room. I installed it in about 15 minutes and I've been feel cool every since. Before I bought the air conditioner, however, I needed something cool to sew in. I had this 100% cotton single knit in my stash for a couple of years. It came from Fashionfabricsclub.com and for some reason I bought 5 yards of it at 60" wide. I don't even look good in this color. Sorry about the picture. I took about 15 using the timer and this was the best one. I can't seem to get timer shots in focus. 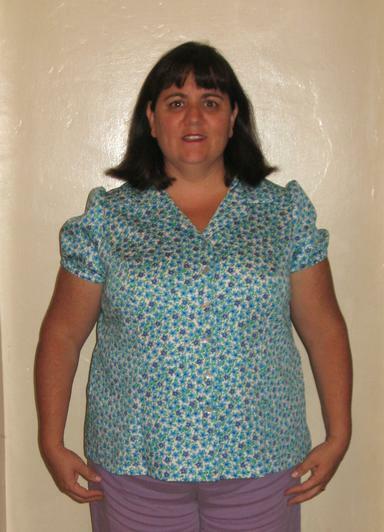 I used KS 3160 to make this summer dress and used a picot fold-over elastic around the armhole and neck edge. I didn't remove the seam allowance before putting on the FOE so the shoulders are wider and the neckline is higher than it probably should be. I made it as a dress, but Husband and Son say it's a nightie. What do you think? Should I wear it outside the house? Like to the grocery store? My sewing room is clean. The air conditioner is keeping it about 78 degrees and I have the next couple of weeks with very few commitments and lots of time to sew. So, what should I make? 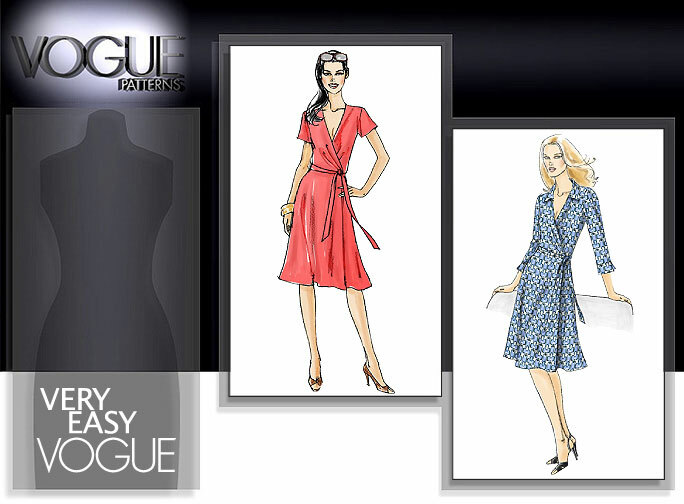 After this post I'm going to work on the Vogue 8379 alterations, but I'm sure I can get it made by tomorrow. After that, I don't know what to sew. Any ideas or suggestions? I finally got some good pictures of my new blouse. I love how it turned out. I love how it fits. I love the pockets. I was trying to copy a super cute Burda WOF blouse. Instead of tracing, upsizing and then altering the blouse from the magazine, I used a previously fitted Burda Plus WOF blouse pattern and did a sort of frankenpattern to it. I think I got the details just right. 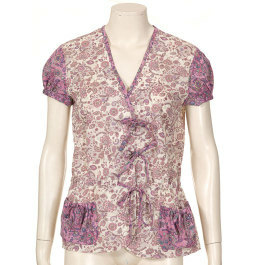 Instead of being romantic like the inspiration blouse, mine is more whimisical. I really like this blouse pattern on me. It fits well in both the front and the back. The back has two princess seams plus a center back seam. Yep, that's a total of 5 seams in the back. The seams makes for a great fitting blouse. For the main body of my blouse I used this blouse pattern. 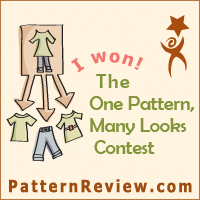 This blouse pattern was originally a jacket pattern, which I redrafted to be a blouse. 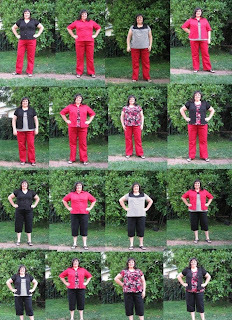 You can read the review on how I completely changed the original Burda Plus WOF pattern in my review of this pattern. Then I stole the sleeves from McCall's 5181, which is OOP. I'm glad I remembered I had the sleeve pattern in my stash because the puffed sleeves I put on the original blouse were too small and would have ruined the look of this blouse. Insted of the snaps that I had originally planned on using for this blouse, I decided to use buttons. I couldn't find anything with the color combination I needed so I used two different buttons and stacked them. I love how they look on the blouse since they mirror the circle theme in the binding. Once I finished the whimsey blouse, I decided I needed a white t-shirt. At my ASG meeting, we discussed some new ways to change up our t-shirt patterns, so I decided to add a yoke to mine. Then, since I had a yoke that needed embellishment, I pulled out some stretch lace I had in my stash. Unfortunately, I burned holes in the lace while pressing it. This became a design opportunity. While in New York, I found some lovely roses trim in white. I tried to place the trim in an artistic manner. I'm not quite sure I like the effect, but that's how it's going to stay. It does look much better than a burnt hole in my lace. As for the yoke and added gathers, I do like these design features, they just don't look that great on me. Probably because my cotton doesn't have enough stretch to hang properly. It's just a tad too tight to look good over my bust line. I'm going to give this rendition of KS 2900 one more try. I'll lower the neckline, add more gathers, spread them away from the center positioning them over the breasts and use a more stretchy fabric. These are newly drafted cap sleeves and they need to have more cap height to look really good on me. With these changes, I think I'll be happy with this pattern. I took my neice to the garment district yesterday. She is losing weight and doesn't have anything to wear that fits. She bought a lot of fabric and I'll be helping her with pattern fitting and cutting out her patterns. She and I are very similar in size except that she needs more of a FBA than I do. Thankfully, I probably won't have to help her much with the sewing. But you know since I was there and had a few $$$ in my pocket, I had to buy something. At Mike's I found this lovely brown and white rayon/lycra suiting and 5 yards came home with me. It will be a jacket and pants for fall. It has some good weight to it and I hope will wash up nicely. This is another suiting I found in her $1/yd box. I'm not sure what the fabric content is and I don't think it has any lycra, but I thought it would make a nice jacket. This is a lovely rayon crepe that looks great with the brown/white suiting. It will become some sort of blouse. I also bought a great quality cotton/lycra shirting in red. The red is a blue red, not an orange red so it will look good on me. This is a jersey I went dumpster diving for at Michael Levine's loft. I'm not sure what it will become. This is also a poly/lycra jersey. It's a border print and this picture only shows 1/2 of the print. It is mirrored on the other half so that the navy blue border runs down both selvages. I didn't realize this in the store, but with the print it will have to be cut cross grain. Unfortunately, the cross grain isn't stretchy. Because of that I'm not sure how to use this fabric. I also got a champaign nylon knit to use as a half slip. Some of my dresses need a slip and I think the nylon will keep static cling at bay. I hope the next time I go downtown, I can have a little more self-control. I do not need any more fabric! I have a birthday party to attend today, then the rest of the week is dedicated to sewing. I'll show you know how it turns out tomorrow when I get the sleeves in. 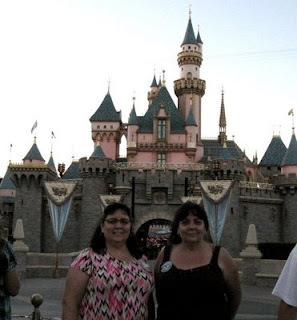 Monday was my birthday so Twin Sister and I went to Disneyland to celebrate. She hadn't been in almost 20 years, it's been about a month for me. The park was not crowded at all so we got to enjoy a character breakfast buffet, go on all the big roller coaster rides, and see the fireworks from the front row. This was probably one of my best birthdays in a long time. 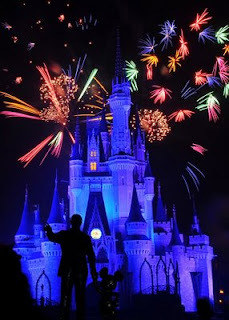 I don't think I mind growing older if I can do it in the Happiest Place On Earth. When I got home around midnight, Husband had a small gift and a cute card waiting for me. Chocolate, just what I need. What I need is to stick to my diet! I finally got the second Annie costume finished. This one was drafted from a children's pattern. I had to make it about 6" bigger all over. That's not as easy as it sounds. The girl loved it, she was twirling the skirt through the dressing rooms last night. I've been procrastinating sewing up the Annie dresses and spending way too much time on Pattern review this last week. In fact, I was the most active on the boards for the week. Not a distinction I want. How embarrassing to point out how much time I'm wasting on the computer. So what am I doing right now? OK, I'm thinking about sewing, does that count? Now it's time to get back to sewing for me. Debbie Cook suggested I use one of my TNT patterns and cut something from my new fabrics just to give me a sense of accomplishment before tackling my woven top. So, that's what I'm going to do today. I haven't made a Ottobre Puffed-sleeve top this summer yet, so that's what I'm doing today. The fabrics are in the dryer right now so I'm off to clean up a spot on the cutting table. 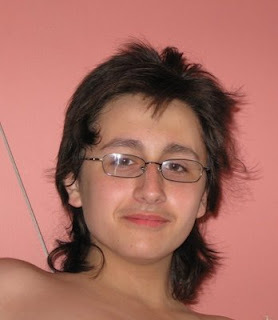 My son (isn't he cute?) wanted to attend the Anime Expo this year and since he'll be 15 yo next month, I decided to let him go without his parents, ACK! My nephew, who has an emotional disability and is almost 30 yo went with him. They both have about the same maturity at some level, but my nephew is great with kids and knows how to keep them safe. The reason I'm telling you this is because I had to drive him into Los Angeles to the Convention Center this morning. AND since I couldn't let a trip downtown go to waste, I just had to stop a few blocks away at the garment district. I hit the jackpot with poly/lycra jerseys! I see a wrap dress in my future. Melody and Michelle have both made this pattern, Vogue 8379 and I want to make it too. They both look so lovely in this wrap dress and they both got good bustline coverage with only a FBA. I'll have to do a FBA and a few other alterations too. This is a low quality poly lycra jersey I bought at Michael Levine's Loft where all the fabric is $2 a pound. That worked out to around $1.33/yd. for me today. It's sort of like dumpster diving, however. You never know what you're going to get, but you can be sure it'll be dusty and wrinkled at the very least. I got 5 yards of this lavender and turquoise jersey to use as a muslin for my wrap dress. It's a bit pretty in a gaudy sort of way. If a muslin actually worked out the first time, I'd probably drop dead so there isn't any worry that I'd actually wind up wearing this fabric. This one is a good quality poly/lycra jersey I got at Mikey's on 9th street. It was $4 yd and has such a lovely hand. This is what my wrap dress will be made from when I get the pattern perfected. 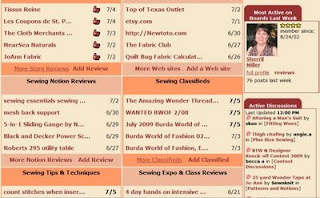 The back ground is a dark brown which is a great fabric color to start my fall sewing with. If I feel the need for another wrap dress once I get the first one finished, I think this snakeskin print will make a nice second dress. It came from the Loft as well. This is another $2 pound fabric, but I saw it in the regular store for $5/yd. It's rayon/lycra and I was lucky enough to find 1.5 yards of it. It will be a new top in the fall. These two were at the Loft too. I don't have a garment in mind for them, but I thought they were nice enough to follow me home. This animal print came from the mill end store close to my house. They don't get new fabrics in very often, but I hadn't seen this one before and had to pick up 1.5 yards for a fall t-shirt of some sort. Just one more week until the opening of my son's play. I may have mentioned that he's playing a mobster in Annie for a local production of the play. They will have 12 performances and it will run for two weeks. Then my life can get back to normal. I haven't been able to sew for myself this week because I have been working on costumes for the play. Above is the Christmas dress that Annie will be wearing. I still have to make her another dress, it will be pink striped with lace. Annie who is usually a small child was cast with a 14 yo girl who has developed into quite the young woman. None of the costumes for the play fit her. I've also been doing alterations and stitching on trim and such. I want to wish everyone a happy and safe Fourth of July. 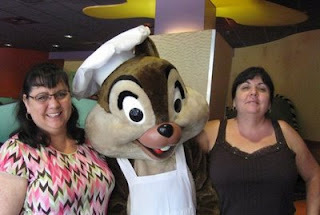 My birthday is on Monday so my twinsis and I will be visiting Disneyland. They are having a Celebration Campaign this year where you get to go free on your birthday. Neither one of us will have to pay! What a very nice present for both of us.